The CompTIA Server+ certification tests you on your knowledge with server hardware and software. It validates knowledge of server issues and technology. CompTIA recommends you have 18 to 24 months of experience in server technology along with a CompTIA A+ certification. It is not required though. With this certification you can perform job roles as a network administrator, network engineer, systems administrator and web site administrator. This certification is an international vendor neutral credential. This means it is well recognized all over the world in the IT field. 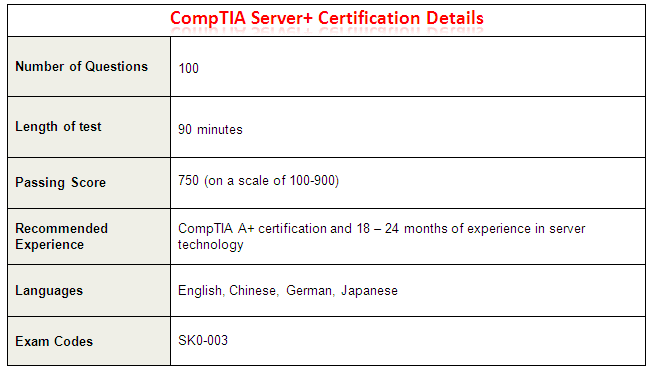 The CompTIA Server+ certification is a good entry-level certification for server technology. The Microsoft server related certifications usually require more than one exam to get certified. The Server+ requires only one exam and can help you land a job as an administrator meanwhile you work on the more advance Microsoft Server certifications. 2.) Learn the material by using CBT Nuggets or Testout. My favorite one is Transcender. They offer great e-learning courses and Virtual Labs. Also make sure you get a hold of practice exams. Try Transcender, they guarantee you will pass your exams on the first try. 3.) Buy a certification exam voucher. 4.) Schedule your exam at your nearest location. If server technologies interest you about computer networking then the Server+ certification will put your foot in the door pretty quickly. It only requires one exam and your certified! Add this certification along with an A+ and Network+ certification to your resume and you will look like a great candidate for any network administrator job opportunity. Practice at Home....And Don't Stop Practicing! Make sure you download a virtualization program like VMware Player (it’s free), and install many Windows and Linux server virtual machines to practice. Microsoft provides a trial version for 6 months with all of their server distributions. When the 6 month trial is over, re-install again from scratch and keep practicing. Their evaluations bring all the features the real software would bring. Tell Us About Your Home Practice Lab for the Server+! It's easy to do, Just use the following form to submit your own page describing your home practice lab that you use to practice your CompTIA certifications. Also provide tips on how to earn the Server+ certification.